In this case study, Davidalen Fountain, Systems Engineer and Brad Templeton, IT Director for Sacramento Ear, Nose & Throat Surgical and Medical Group, Inc. in Sacramento, California, describe how they replaced multiple paper-based processes with Gravity Flow and generated cost savings of over $4,000 USD per month. Problem: The administrative burden of our paper-based systems was causing a bottleneck in requests from employees for multiple processes including but not limited to overtime requests, mileage and expense reimbursement requests, and business card orders. Two full time staff members were required to verify all steps were completed and then scan the documents into our data store system. These two staff members are also our coordinators for operations and clinical staff so this was causing a constant backlog of requests and had a significant impact on production in other areas. Solution: Gravity Flow was the only product which provided a truly cost effective digital workflow solution to the problem and allowed us to free up staff to focus on their more productive responsibilities. Below is a swimlane diagram demonstrating the one of the processes we implemented using Gravity Flow. Gravity Flow simplifies the traffic of paper work and increases the efficiency of our company enormously. 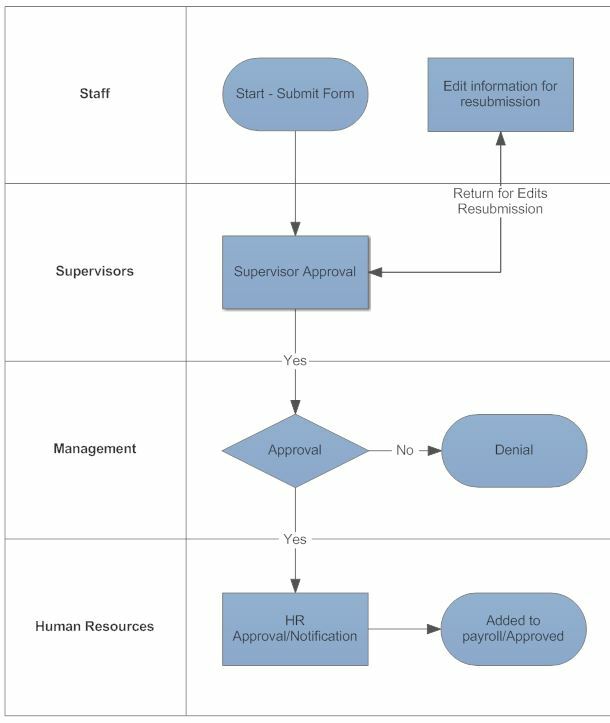 After implementing Gravity Flow we were able to remove the administrative responsibility from those staff members and rely solely on the routing rules inside of Gravity Flow. We would estimate this has saved us over $4,000 USD per month as it took about one hour per day for approximately 8 people depending on the requests and where they had to flow to. As many organizations can relate, paper and toner aren’t cheap. By cutting out the printed papers we have cut back on supply usage which is also a large money saver. In conclusion, we have saved a significant amount of time and money by switching to Gravity Flow. We would highly recommend this product to any company looking for a quick and easy to use system for managing workflow steps. On top of the easy to use interface and the constantly growing features list the Gravity Flow staff has been incredibly helpful and resourceful when it comes to working out any problems we have encountered. Sacramento Ear, Nose & Throat Surgical and Medical Group, Inc.